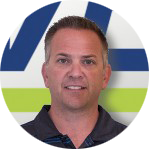 In addition to being the co-founder and co-owner of the Wessen Indoor Tennis Club, Brian DeVirgilio is one of the most highly respected tennis professionals in the Midwest. Designated an “Elite Tennis Professional” by the USTA, Brian has, for the past decade, been developing an impressive string of tennis management and leadership successes. His tennis management company, housed first at the Grosse Pointe Hunt Club, turned empty courts into one of the most successful tennis programs – and clubs – in the area. Securing the region’s only USTA-sanctioned, professional event – the “Midwest Open Professional Mixed Doubles Tournament,” Brian oversaw all aspects of the 20K event and was responsible for recruiting world-ranked players to compete in the tournament. More recently, at Troy Racquet Club, Brian established the Troy Tennis Academy (TTA), a leading junior academy that attracted over 1,500 students in two years. In 2012, he was recruited by the Bloomfield Open Hunt Indoor Tennis Club to become their director of tennis and brought his junior academy along with him. He also serves as director of tennis at Forest Lake Country Club during the summer months. Still passionate about teaching tennis, Brian has coached and guided the careers of numerous nationally and sectionally ranked junior players, while assisting many others in earning college scholarships. He has served as the head coach for the Lahser Girls’ Varsity Tennis Team, the Grosse Pointe North Varsity Tennis Team and the assistant coach of the Cranbrook Boys’ Varsity Tennis Team. Brian himself enjoyed an enormously successful and rewarding junior, and college, tennis career. As a junior, he was consistently ranked “Top 10” in the Midwest and “Top 40” nationally. Later in his career, he competed with some of the best players in the world (Sampras, Chang and Agassi to name a few) and holds career victories over Todd Martin (who also was his junior doubles partner) and Michael Chang. Brian was a major force in college tennis, as well, capturing three Mid-American Conference (MAC) singles, and three MAC doubles championships while at Ball State University. After graduating, Brian spent time on the professional tour, competing throughout Europe and the United States. Brian holds a Bachelor of Science from Ball State University and a Master of Arts from the University of Detroit.